With chickens soon to become the most widely consumed meat in the world, efficiency in growth and feed utilization are essential to the industry. The chickens' intestines play a crucial role in this and their health and well being, making the intestine a prominent area of poultry research. Here to discuss this field is Emily O’Reilly, author of a research paper recently published in Proteome Science. In 2015 the world produced 115 million tons of poultry meat, slightly less than the amount of pig meat produced. The unparalleled rate at which the modern broiler (meat) chicken can grow and convert feed into muscle has resulted in chicken becoming one of most widely consumed meats in the world. By 2025 poultry will overtake pork and account for the largest share of meat produced worldwide. The popularity of chicken across the globe is related to its competitive price, culinary versatility and its ability to be enjoyed in areas of the world where pork is not eaten. The consumer demand for lean, safe and competitively priced meat continues to be met by industry thanks to advancements in selective breeding for growth, breast yield and feed conversion ratio over the last 50 years. The intestinal tract of the broiler chicken is a key research target in the poultry sciences. However in a competitive market where feed costs remain the biggest input costs in broiler production, efficiency in feed utilization remains a primary concern for producers. As such the intestinal tract of the broiler chicken is a key research target in the poultry sciences. The intestinal tract is the critical area in which the complex process of converting feed into the muscles occurs. In addition to this, the intrinsic link between intestinal microbiota (gut flora) and the overall health and welfare of the birds is well established. Because of the central role the intestine has in mediating not only the digestion and absorption of nutrients from the diet but also the overall health and wellbeing of the bird, this area of research remains at the forefront of poultry research. Whilst this dynamic target has been studied in multiple ways, surprisingly few studies have taken a proteomic approach; those that have revealing that supplementation with bacteriocidin and E. faecium, genetic selection and exposure to atmospheric ammonia can all elicit changes in the abundance of large numbers of proteins in the intestine. Similarly, exposure to re-used litter and the resultant change in the intestinal microbiota of the birds reduces growth and illicits changes in the abundance of a large number of proteins involved in a wide variety of molecular pathways and biological actions. Even small changes in growth and feed utilization, when scaled up across the world results in billions of dollars in losses. This established model was used to investigate how a disruption to the intestinal microbiota results in the reduced and uneven growth seen in broilers. What molecular mechanisms are involved at the level of the intestinal proteome, and could any of these proteins be used as biomarkers? Such a model, while appearing rudementary in its approach is ideal for replicating a challenging growing environment of a bird and one that may cause a disruption to the microbiota and the overall performance of a bird. Even small changes in growth and feed utilization, when scaled up across the world results in billions of dollars in losses steming from inefficient feed utilisation and loss of potential growth. In this paper we sought to investigate the molecular mechanisms involved when a disruption in the microbiota reduces the weight gain in birds that otherwise appear healthy. In doing so we also hope to have demonstrated how proteomics can offer an insightful approach to investigating intestinal health in chickens, an area that will continue to dominate the poultry sciences as the industry continues to reduce its use of antimicrobials. 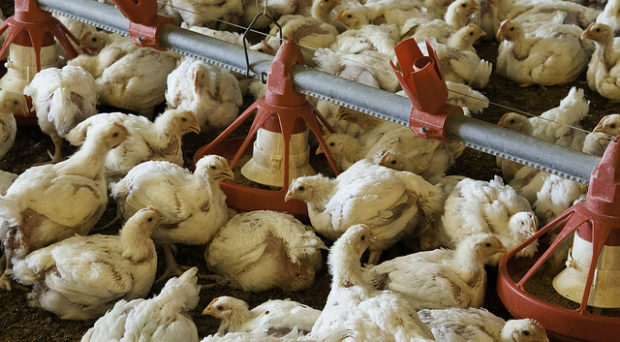 Anywhere in the world, methods that’s are currently being used to grow the birds for meat, does not sound good. Human want to produce more meat in less time for more profit where as there are genetic defects in this process and this must not be good for human’s health. Emily O’Reilly is a postdoctoral researcher at the University of Glasgow. Taking a proteomic approach to uncover the changes that occur in the broiler chicken intestine during a mixed microbial challenge was part of a wider series of studies that sought to identify suitable biomarkers for intestinal health and immune function in chickens. Her areas of interest lie in the utilisation of proteomics to identify biomarker targets in the intestine and faeces/excreta and the development of point of care tests for use in agriculture. Emily is also a Teaching fellow at the University of Edinburgh where she contributes to the M.Sc. online course in International Animal Health.